The benefits of walking for older people are numerous. Walking not only improves your health and well-being but in many ways will help you live independently for longer. Walking strengthens your muscles. This is important because as we age our muscles tend to atrophy. Muscle strength is especially important for our bones as they tend to become more brittle with age, delaying the onset of osteoporosis and osteoarthritis. Greater muscle strength helps offset the deterioration in bone mass. And, taking to the streets keeps your joints more flexible. It is perfectly natural to put on weight as we age as our metabolism slows down, but we don’t have to give in to the battle of the bulge without a fight. Walking is a great way to keep your weight down. This reaps additional benefits to your entire body, as less weight decreases the stress on your heart and bones. Daily exercise is proven to reduce the risk of heart disease, stroke, colon cancer, and diabetes. It is also known to help reduce blood pressure in people with hypertension. Falling is a serious danger older people face and is a major cause of broken hips, leading to an extended bed stay and additional health problems. Fortunately, walking improves your balance and coordination, decreasing your likelihood of falling. The trickle-down effect on your mental health from all the physical health benefits is significant as well. Feeling and looking healthier increases your confidence and improves your mood. This leads to an overall physically and mentally healthier you. When you add all that up, walking tends to reduce anxiety and depression. If these aren’t enough reasons to get out and start walking, consider that it can improve your social life. Walking is a great way to get out and meet people or the perfect vehicle to socialize with your friends. The ability to walk without assistance is one of the strongest indicators that someone can live independently. Older people who exercise regularly are more likely to do things for themselves. Exercise does not need to be strenuous to be beneficial for your health. 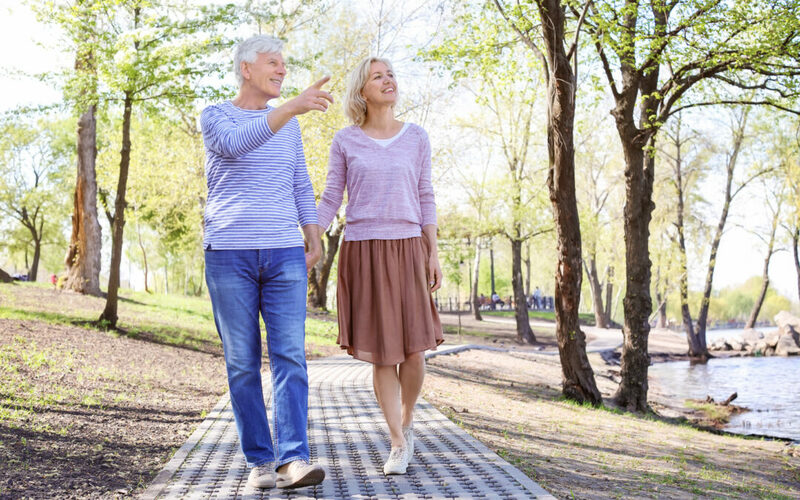 In fact, the Australian Physical Activity and Sedentary Behavior Guidelines recommend people over 65 engage in 30 minutes of moderate intensity activity – walking – per day. So, for a longer, healthier, happier life, get out and start walking.